Home Answering religious questions	Was Lady Fatimah (PBUH) content with Abu Bakr? 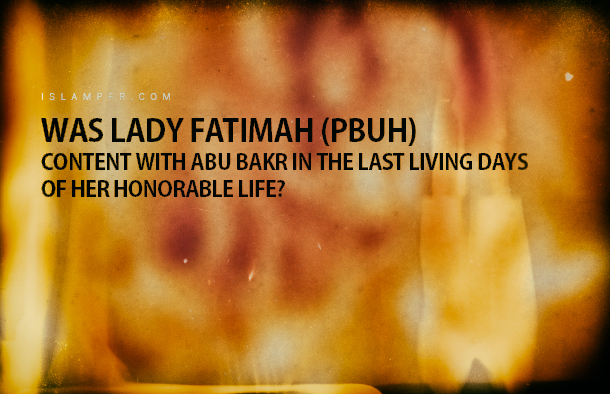 Was Lady Fatimah (PBUH) content with Abu Bakr in the last living days of her honorable life? Lady Fatimah’s (PBUH) refusal to accept the allegiance to Abu Bakr is narrated in Sahih al-Bukhari; however, I read an article from Bayhaqi implying that Lady Fatimah (PBUH) was later content with both Abu Bakr and Omar. Please, give a complete explanation about how Lady Fatimah’s (PBUH) refusal to accept allegiance in Sunni sources is described, and since Sahih al-Bukhari is considered to be fully authentic and true by Sunnis, is there a possibility that they refuse to accept the fact that Lady Fatimah (PBUH) did not accept the allegiance to Abu Bakr? In such a case would that be out of their undue prejudice or do they refer to the Hadith in Bukhari regarding Lady Fatimah’s (PBUH) allegiance based on their own Biographical Evaluations? Night burial of Lady Fatimah (PBUH) is another proof of her discontentment. Bukhari says” When Fatimah (PBUH) passed away, her husband Ali (PBUH), buried her at night without informing Abu Bakr and he conducted the funeral prayers by himself . The people, who favored the government, discontinued the little respect they had for Ali (PBUH) after her death. After such a situation, Ali (PBUH) went to Abu Bakr and gave him an oath of allegiance . On the other hand it is found in Sunni sources that Abu Bakr in his last living days said : “I wish I hadn’t attacked the house of Fatimah ” This proves that Abu Bakr was worried about Lady Fatimah’s (PBUH) discontentment with his actions. In brief: the weakness in the source reference of Shaabi’s quotation against plenty of proof that Lady Fatimah (PBUH) was discontent with Abu Bakr and Umar, makes it impossible to accept the authentication of Shaabi’s quotation. Even if we accept the quotation, its chronological precedence to the conflicting quotations invalidates it. Because, the evidence shows that she was angry with them up to her demise, but Shaabi’s quotation is related to a specific period of time and doesn’t point out the continuance of her contentment up to the end of her honorable life. Bayhaqi, Ahmad Bin Al-Hussain, Al-Iitiqad wa al Hadaya ila Sabil al Rashad ala Madhab al Salaf wa Ashab ul Hadith. This is narrated by Bayhaqi through several narrators from Shaabi but there is not any reference to the persons from whom Shabbi has narrated the quotation, hence this is a Mursal quotation. Bukhari, Muhammad ibn Ismail, Aljame al Musnad al Sahihul Mukhtasar Sahih al-Bukhari. Researched by: Mohammad Zahir bin Nasser Al-Nasser, Volume 4. Ibn Qutaybah Dinawari, Abdullah ibn Muslim, Al-Imamah wal Siasa, Research: Shiri, Ali. Volume 1. Tabari, Muhammad ibn Jarir, Tarikh al Rusul wa al-Muluk (History of the Prophets and Kings), Volume 3.